Andy joined AERU as a Research Fellow in March 2000, and has since worked on a wide range of projects spanning environmental pollution and its mitigation, soil carbon storage and climate change, managing environments for ecological recovery, the international delivery of pesticide properties data, analysis of agri-chemical and veterinary product properties, novel approaches to managing agricultural pollution, and broader sustainability issues. Sustainable resource use in a changing world. Environmental best practice for rural businesses. Sustainable mitigation of environmental pollution. BSc in Geography from Leeds University. MSc in Environmental Water Management from Cranfield University. PhD in Non-point Source Water Pollution from the University of Hertfordshire. PGCert in Learning and Teaching in Higher Education. 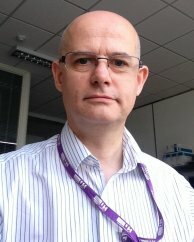 Andy is also a Chartered Environmentalist (CEnv), a Full Member of the Institute of Environmental Management and Assessment (MIEMA), a Fellow of the Higher Education Academy (FHEA) and a member of the UK Irrigation Association. Having previously worked in the financial sector, Andy was employed at Cranfield University, on the prestigious EU funded MEDALUS (MEditerranean Desertification And Land USe) project; and has worked collaboratively with the Environment Agency and Thames Water. Establishing a field-based evidence base for the impact of agri-environment options on soil carbon and climate change mitigation. Catchment approach to reducing metaldehyde pollution using Payments for Ecosystem Services. Review of published exposure to pesticides data for residents and bystanders. Planning Your Entry Level Stewardship Application. Dr. Andy Green's extended publications list.